Deputy Works Minister Datuk Yong Khoon Seng has termed women as Malaysia’s vital source of human resources to spur its development. He thus called on more women to assume leading roles to help the country achieve further breakthroughs. “Women of today are no longer confined to the roles of wife and mother. Many of them have excelled in many areas such as politics, finance, industries and education,” he told a dinner marking the Kuching and Samarahan Divisions Chinese Women Association’s 63rd anniversary last Saturday. Yong, who is Stampin member of parliament, said it was quite obsolete to insist that only a certain gender should serve in selected industries, particularly in this modern era. He stressed that for as long as a person had the capability, the issue of gender should not get in the way. “If the person has great knowledge in a certain field and is capable of discharging the duty, we shall by all means support the person to lead,” he said. He noted that the women association was one of the earliest community-based organisations (CBOs) in the city. Given its history, the association had played its part to elevate the social status of women besides enlightening them on their rights, he said. He hoped that it would persevere in its undertakings so as to be able to organise more healthy programmes for members and the communities. During the dinner, the association through Yong also handed out ‘angpow’ and goodies to eligible elderly members. 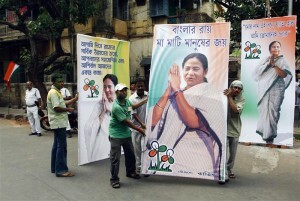 The people’s verdict in the state elections of West Bengal and Tamil Nadu has put Mamata Banerjee and J. Jayalalithaa in the chief minister’s chair. With Sheila Dikshit in Delhi and Mayawati in Uttar Pradesh, India will now have four women chief ministers — no mean feat for a country that usually associates politics with the male gender. Still, the poll triumphs can’t hide that the road to women’s empowerment in India has plenty of bottlenecks. For one, critics of the Women’s Reservation Bill (which if passed will reserve one-third of parliament and assembly seats for women) have ensured the bill has remained on the table in the lower house of parliament. And despite the examples of Indian President Pratibha Patil and Congress party head Sonia Gandhi, few can deny that the number of women in Indian politics is not commensurate with the corporate world where several Indian women hold sway over multinational companies. Women’s liberation groups say that discrimination in politics is derived from the deep-seated hypocrisy of Indian culture, one where female deities are worshipped but women still have little say over their lives. And that even in cases where suitable female candidates are available for national and state elections, the choice has gone in favour of a male candidate. While the Congress party headed by Gandhi has only one woman chief minister in Dikshit, the opposition Bharatiya Janata Party doesn’t have any, despite its vocal support for the Women’s Reservation Bill. Have things changed since the state polls? Are the election wins for Banerjee and Jayalalithaa a milestone for women’s empowerment in India? Share your views. MANILA, Philippines — After seven years languishing in the legislative mill, a landmark legislation on women’s rights has finally been enacted. President Gloria Macapagal-Arroyo signed Republic Act 9710, or the Magna Carta of Women, Friday morning in a ceremony attended by lawmakers and women leaders at the Rizal Hall in Malacañang. Women in Malaysia continue to rank as one of the highest scoring countries around the Asia/Pacific region. They are feeling more confident and positive about the role they play within the business and economic environment according to the research study. According to the fourth annual MasterCard Worldwide Index of Women’s Advancement 2008, released by MasterCard Worldwide today, Malaysia’s score rose to clinch third highest within the Asia/Pacific region, drawing a score of 76.89. Around the region, the overall Index score across the 13 Asia/Pacific markets surveyed dropped from 73.24 in 2007 to 70.38 in 2008. Two showing the ratio of female to male participation in the labor force and tertiary education, are based on source data from national statistics bureaus. Two based on survey data, measuring female and male respondent perceptions of whether they hold managerial positions and earn above median income. These subjective factors are a gauge of how positively or negatively respondents feel about their place in the workforce. The resulting total Index figure obtained is a combined calculation of these indicators showing how close or how far women in each market are to being equal to men. A score under 100 indicates gender inequality in favor of males while a score above 100 indicates inequality in favor of females. A score of 100 indicates equality between the sexes. “Malaysia continues to be a key market in encouraging the evolution of women as consumers and as influencers changing the socio-economic dynamics across Asia/Pacific. Malaysian women seem to be closing the gap with men in the socio-economic arena. These are subjective indicators which gauge how positive the respondents feel about their place in the workforce. The scores indicate that Malaysian working women are more confident and self-assured,” said Georgette Tan, vice president, Communications, Asia/Pacific, Middle East & Africa, MasterCard Worldwide. “As they become more educated and qualified, evolving in tandem, the workplace has become more inclusive with greater opportunities for women to attain roles in management and leadership. Across the 13 Asia/Pacific markets, the Index scores ranged from a low of 49.83 in Japan to a high of 86.82 in the Philippines. Hong Kong took second place at 77.37, closely followed by Malaysia in third place 76.89. In South-East Asia, positive sentiment amongst women was clear. Four out of the six markets surveyed, Malaysia, Indonesia, Thailand and Vietnam, achieved an uplift in 2008 on their 2007 total Index scores. In the remaining two markets – The Philippines and Singapore – only a very slight decline was recorded over the same period. In the rest of the Asia/Pacific region, five of the seven markets saw a decline. The greatest of these were in New Zealand, China and Taiwan, suggesting that women’s positive sentiments in these markets are on the wane. By comparison, Hong Kong and Japan illustrated a very slight uplift. Largely, the decline in this year’s Index score for the region was the result of fewer women considering their work roles ‘managerial’ or their income ‘above the median’ than they did one year ago. The Index found that across the region, the number of women considering themselves in managerial positions fell from 56 women per 100 men in 2007 53 in 2008. Meantime those considering their income to be above the median fell from 68 women per 100 men to in 2007 to 59 per 100 men in 2008. “While women continue to close the gap in achieving parity with men in the areas of labor force participation and tertiary education, women’s self-perception regarding the subjective factors of the Index – managerial positions and above median income – have continued to dip for the second year in a row. This appears to indicate that women are feeling less confident about their current status, and whether due to the economic, political or social landscape, the direct result is that men’s confidence and resulting advancement is increasing to fill the gaps,” said Tan. The Global Summit of Women is an annual forum bringing women leaders in business, government and enterprises of all sizes together for exchanges of best practices in advancing women’s economic opportunities worldwide. MasterCard has devoted extensive resources to developing a deeper understanding of the women’s segment in Asia/Pacific. The findings from this fourth MasterCard Worldwide Index of Women’s Advancement highlights that there is still much to be done in terms of improving women’s self-perceptions. MasterCard is committed to empowering women through initiatives such as its U21 Global Scholarship for Women in Travel and Tourism, which was launched in 2006 to provide working women professionals a program to develop their leadership skills and realize their full potential in the area of travel and tourism. The program comprises 20 scholarships for the U21Global Executive Diploma of Business Administration that can articulate into The University of Nottingham MSc in Tourism and Travel Management. MasterCard has also released a series of consumer and travel reports on women, found at www.masterintelligence.com – an online repository of MasterCard’s proprietary research. There are now three quarters as many women working in the Asia/Pacific region as there are men. Over the four year period since MasterCard Worldwide Index of Women’s Advancement began, the Asia/Pacific Index score for Labour force participation has very slightly increased across all markets – from 75.07 in 2005 to 76.78 in 2008. Vietnam’s economic growth is perhaps driven by women, because the market’s indicator score for women’s participation in the labour force reached 93.77 in 2008. This means there are now 94 women for every 100 men in the labour force in Vietnam – the nearest to parity of any market in the region. The next market with a large participation of women in the labour force is New Zealand where the indicator score in 2008 was 88.29. This means there are 88 women to every 100 men in the labour force in New Zealand. Meanwhile, at the other end of the spectrum, Malaysia’s data reveals the lowest rate of women’s participation in the labour force with 59 women to every 100 men. The total Index score for Asia/Pacific for the number of women in tertiary education this year was 93.15 – or put another way there are 93 women for every 100 men in Tertiary education across Asia/Pacific. In each of the four years since the Index began this number has risen slightly indicating that women’s participation in tertiary education is edging closer to parity all the time. Most impressive of all was the figures for this indicator in Malaysia. Here, more women in tertiary education than men with 135 women to every 100 men. The Philippines also returned some very positive figures with 116 women to every 100, Thailand at 107 and New Zealand’s at 103. Across Asia/Pacific the results for the number of women who perceive themselves to be in managerial positions has consistently decreased since 2006 and in 2008 has reached a total Index score of 52.85. This means that in 2008 across Asia/Pacific, over half as many women believe they are in managerial positions as men. Women’s perception of their participation in management positions has decreased across seven of the thirteen markets in Asia/Pacific in 2008 (Australia, New Zealand, China, Hong Kong, South Korea, the Philippines and Singapore) and increased in six (Taiwan, Japan, Malaysia, Indonesia, Thailand and Vietnam). The most dramatic drop for this indicator was in China where the 2007 indicator score of 71.27 dropped to 55.94. This means that in China in 2008 there are now only just over half as many women (56 women to every 100 men) as there are men who perceive their roles to be managerial. Women’s perceptions that they were earning above the median income has decreased across the region. In 2007 the total Index score for Asia/Pacific was 67.8 meaning there were 68 women per 100 men who perceived their income to be above the median. In 2008 this indicator score has decreased to 59. The most dramatic drop in perception regarding salary was in Taiwan where in 2007 more women perceived that they earned above the median wage than men (113 women to every 100 men). In 2008 this indicator score has dropped to only 68 women per 100 men. In New Zealand a similar decline also took place. In 2007 the indicator score was 97.46, this meaning that 97 women per 100 men thought they earned more than median income. But in 2008 this dropped to less than half as many women as men as New Zealand received a new an indicator score of only 42 women per 100 men.